On 25 March 1916, the Military Medal had been instituted for non-commissioned officers and men of the Army for ‘acts of bravery’. Three months later, in a supplementary Royal Warrant of 21 June, the award was extended to women (British and foreign) for ‘bravery and devotion under fire’. 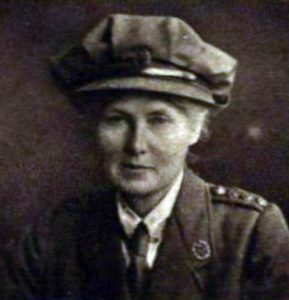 The first awards soon followed—to Lady Dorothie Feilding for her gallantry as an ambulance driver in Belgium (she had previously been awarded the French Croix de Guerre and would later be awarded the Belgian Ordre de Léopold II for her services) and to five nurses for their gallantry during the bombing of 33rd Casualty Clearing Station at Bethune, France on 7 August 1916. Sadly, Margaret Gibson MM did not survive the war; she died of dysentery on 17 September 1918 and is buried in Mont Huon Cemetery at Le Treport. A total of 146 awards of the Military Medal have been to women between 1916 and the suspension of the award in 1993. The most recent were to soldiers of the Women’s Royal Army Corps serving in Northern Ireland—Lance Corporal Sarah Warke in 1973 and Lance Corporal Diane Cooper in 1990. A less well-known award for gallantry and self-sacrifice during the years in which the QMAAC existed was the Medal of the Order of the British Empire. The Order had been instituted in 1917 and the medal had been used to reward industrial workers for acts of courage and self-sacrifice. In December 1918 a Military Division of the Order was instituted and the medal became the principle reward for acts of ‘gallantry or self-sacrifice or distinguished service’ for the women of the Corps during the First World War. Of 510 military awards, 297 were awarded to women of the QMAAC, 22 to the WRNS, one to the WRAF, and two to drivers of the Women’s Legion serving with the Army Service Corps. Formed on 9 September 1938, the Auxiliary Territorial Service provide a vital component of the British Army, at home and overseas, during the Second World War and later in Palestine. In addition to a wealth of administrative roles, women served in technical trades and in anti-aircraft units. Their service was not without risk and the Commonwealth War Graves Commission commemorates over 900 women of the ATS who were killed in action or died during the war. The ATS was subsumed by the Women’s Royal Army Corps when it was formed on 1 February 1949. During the Second World War, six women were decorated with the British Empire Medal for ‘gallant conduct in carrying out hazardous work in a very brave manner’—one for rescuing aircrew from a crashed and burning aircraft, two for gallantry in anti-aircraft units during air attacks, two for providing medical aid during an industrial accident, and one for rescuing a child from a dangerous canal. In addition, five women serving with Home Forces were commended for brave conduct. For another project, I compiled a full list of all the awards to the Auxiliary Territorial Service. Although not actually part of the British Army, it would be remiss to not mention the Women’s Transport Service (First Aid Nursing Yeomanry). The women of FANY had served gallantly in all theatres during the First World War. In the Second World War, in addition to providing women to the ATS and in a range of support activities, FANY proved an ideal organisation to support Special Operations Executive. It acted as a holding unit for many of the women recruited to work behind enemy lines and who suffered so grievously for their bravery—13 of the 55 female agents of SOE were captured and killed. The organisation can also claim some notable firsts: The first award of the George Cross to a woman was to Odette Sansom, who was betrayed and captured in France. Her citation concluded that: ‘During the period of over two years in which she was in enemy hands, she displayed courage, endurance and self-sacrifice of the highest possible order.’ The first posthumous award of the George Cross to a woman was to Violette Szabo, who was captured on her second mission and according to her citation: ‘She was then continuously and atrociously tortured but never by word or deed gave away any of her acquaintances or told the enemy anything of any value.’ Szabo was murdered in Ravensbrück concentration camp. 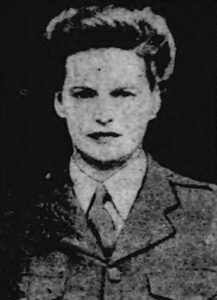 She had previously served with the ATS but had left in 1942 when she became pregnant; her husband was killed in action later the same year. Two George Medals were also awarded to women of FANY who served with SOE, including the first award of the George Medal to a woman attached to the British Army. That first award was to New Zealand-born Nancy Wake, for her gallantry in leading French maquisards. The second, an honorary award, was to the enigmatic Polish émigré Krystyna Giżycki, who served under the name Christine Granville. Serving alongside their male counterparts, the officers and soldiers of the WRAC continued the tradition of their forebears. The majority of the awards to the Corps for gallantry and for meritorious service came from the prolonged campaign in Northern Ireland. In addition to the Military Medals mentioned above, the first award of the Queen’s Gallantry Medal to a female soldier was to Acting Sergeant Jane Freeman in 1981. Since then women in the British Army have earned seven other Queen’s Gallantry Medals—four in Northern Ireland; one following a helicopter crash in Bosnia and Herzegovina; one for treating wounded soldiers following an explosion in Afghanistan; and one for clearing explosives following an industrial accident in the UK. Only three of those, however, were to soldiers of the WRAC. In late 1990 the process began to transfer women out of the WRAC and into the Corps to which they were attached; the WRAC was disbanded on 6 April 1992. In consequence, these four awards of the Queen’s Gallantry Medal were to soldiers of the Royal Logistic Corps and the Royal Army Medical Corps. Finally, a notable ‘first’. 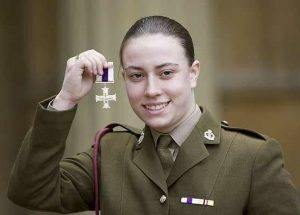 In Iraq on 11 June 2006, Private Michelle Norris, Royal Army Medical Corps, was serving as a medic with 1st Battalion, The Princess of Wales’s Royal Regiment when she treated a wounded soldier under fire during an intense engagement against insurgent forces. Her actions earned her the first Military Cross to be awarded to a woman. To date, four such awards have been made; the other three were all for gallantry in Afghanistan—two to soldiers of the Royal Army Medical Corps and one to a sailor, Able Seaman Kate Nesbitt, a Medical Assistant serving with 1st Battalion, The Rifles. There is no doubt that, 100 years after the raising of the Women’s Auxiliary Army Corps, as they take their rightful place at the forefront of military operations, the women of the British Army will continue to demonstrate courage of a high order and receive just reward. 1. (Back) Later Lieutenant General Sir Henry Merrick Lawson KCB. 2. (Back) The National Archives (TNA). Public Record Office (PRO). (16 January 1917). Physical Categories and number of Men Employed out of the Fighting Area in France. WO 106/362. 3. (Back) The branch of the Adjutant General’s Department responsible for women was established on 19 February 1917. The formation of the new Corps was announced in the press soon afterwards, although speculation on the issue had appeared in the press prior to the Lawson’s report. 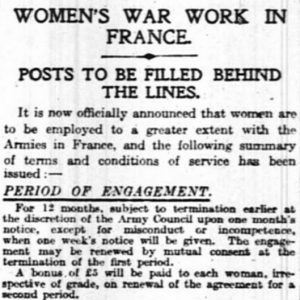 See, for example: ‘Women for Army Work in France.’ (11 January 1917). The Guardian. p 4. Recruiting for the new Corps began in March 1917. For the Army Order see: TNA. PRO. (1917). Recruitment of women: early history of Women’s Army Auxiliary Corps. NATS 1/1300. 4. (Back) For an excellent history of the Corps in France see: Philo-Gill, S. (17 April 2017). The Women’s Army Auxiliary Corps in France, 1917 – 1921: Women Urgently Wanted. Barnsley: Pen & Sword. 5. (Back) London Gazette 5 April 1916. Issue 29538, page 3693. 6. (Back) London Gazette 27 June 1916. Issue 29641, page 3643. 7. (Back) The Lady Dorothie Mary Evelyn Feilding, Monro Motor Ambulance; Matron Miss Mabel Mary Tunley RRC, Sister Miss Beatrice Alice Allsop, Sister Miss Norah Easeby, and Staff Nurse Miss Ethel Hutchinson, Queen Alexandra’s Imperial Military Nursing Service; and Staff Nurse Miss Jean Strachan Whyte, Territorial Force Nursing Service. See: London Gazette 1 September 1916. Issue 29731, page 8653. For details of the awards to the nurses of QAIMNS and the TFNS see: Scarlet Finders. 8. (Back) Unit Administrator Mrs Margaret Annabella Campbell Gibson. See: London Gazette 8 July 1918. Issue 30784, page 8029. The other awards to women of the First Aid Nursing Yeomanry published in that Gazette were for bravery during a bombing attack on 18 May 1918 near St Omer. 9. (Back) For a complete account of these awards see: Gooding, N G. (18 August 2013). Honours and Awards to Women: The Military Medal. London: Savannah. 10. (Back) W/439979 Lance Corporal Sarah Jane Warke, Women’s Royal Army Corps. London Gazette 18 September 1973. Issue 46080, page 11116. 11. (Back) W0476512 Lance Corporal Diane Lesley Cooper, Women’s Royal Army Corps. London Gazette 10 May 1996 (to be dated 15 May 1990). Issue 54393, page 6549. 12. (Back) For a detailed history of the earliest version of the Medal of the Order see: Willoughby, R. (2012). For God and the Empire—The Medal of the Order of the British Empire 1917-1922. London: Savannah. 13. (Back) Women’s Royal Naval Service: London Gazette 9 May 1919. Issue 31331, page 5776. Woman’s Royal Air Force: London Gazette 3 June 1919. Issue 31378, page 7035. Queen Mary’s Auxiliary Army Corps & Women’s Legion: London Gazette 23 January 1920. Issue 31750, page 964. 14. (Back) From 1922, but particularly from the beginning of the Second World War, the British Empire Medal (prior to 1941 called the Medal of the Most Excellent Order of the British Empire for Meritorious Service) could be awarded as a third level award for gallantry in certain circumstances. From 1958 crossed silver oak leaves on the ribbon denoted such an award. The medal ceased being awarded for gallantry when the Queen’s Gallantry Medal was instituted in 1974. 15. (Back) London Gazette 2 July 1948. Issue 38340, page 3825. 16. (Back) London Gazette 20 August 1946. Issue 37693, page 4175. 17. (Back) London Gazette 17 December 1946. Issue 37820, page 6127. 18. (Back) London Gazette 17 July 1945. Issue 37181, page 3676. 19. (Back) An honorary award granted on 23 January 1946. 20. (Back) London Gazette 14 April 1981. Issue 48583, page 5528. 21. (Back) London gazette 15 December 2006. Issue 58183, page 17359.